As I've written many times over the years, creating videos is one of my favorite classroom projects. Recently, I shared some of my tips for planning classroom video projects. 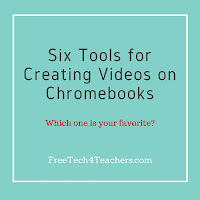 Shortly after publishing those tips I was asked for a recommendation for creating videos on Chromebooks. 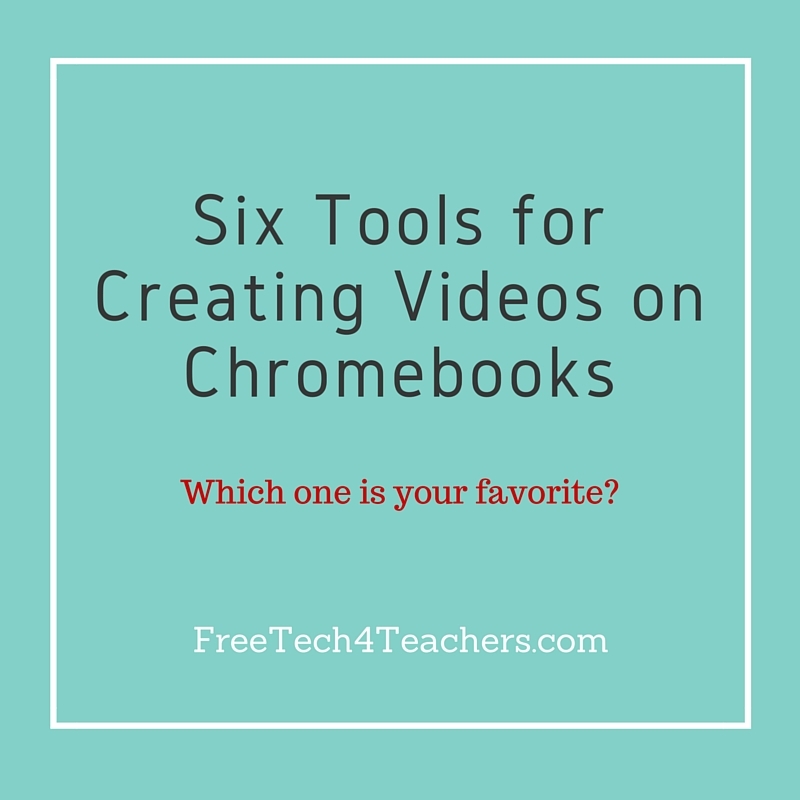 Here are some of my go-to video creation tools to use on Chromebooks. Wideo is a neat video creation service that allows anyone to create animated videos and Common Craft-style videos online through a simple drag-and-drop process. A couple of months ago Wideo started offering templates to help users start their video projects. Wideo templates provide a basic framework for a video's theme. A couple of the templates that might be of interest to teachers are the slideshow template and the curriculum template. PowToon is similar to Wideo and is also a great tool for creating animated videos online. PowToon provides a drag-and-drop editor for creating animated videos. The videos that you create feature digital paper cut-outs on a colorful background. Think of PowToon as an online tool for creating videos in the style made popular by Common Craft. PowToon provides drawings of people and objects that you can arrange on blank canvas. After adding your narration to the arrangement you can publish your video. Within YouTube there is a free tool for creating audio slideshows. You supply the images and YouTube supplies the audio track. You can pick from thousands of audio tracks to match to your slides. After adding your slides and selecting an audio track you can add speech bubbles to your slides. I demonstrate all of these steps in the video embedded below. Last year at the Practical Ed Tech Summer Camp a number of us used Stupeflix to create videos. Stupeflix doesn't require users to register in order to produce a video. In the video embedded below I demonstrate how to use Stupeflix to create a video without registering on the site. For creating a screencast video on a Chromebook TechSmith offers Snagit for Chrome which supports creating screencasts that you can save into your Google Drive account. To use the screencasting option in Snagit for Chrome you will have enable the both the Snagit for Chrome extension and the corresponding Snagit Chrome app. The Snagit Chrome extension is what allows you to capture your screen. The Snagit Chrome app allows you to save your screen captures in your Google Drive account. You do have to install both the extension and the app for Snagit to work correctly. Topics like this one and many others will be covered in depth during the Practical Ed Tech Chromebook Camp on July 18th and 19th. Discounted early registration is now available. Group discounts are available. Email me richardbyrne (at) freetech4teachers.com or click here to learn more.